Marketing Automation is on the rise and is one of our prominent Digital Marketing trends, and for good reason. B2B marketers say the top benefit of Marketing Automation is its “ability to generate more and better leads” (Pepper Global, 2014). According to Autopilot (2015), marketers using automation software generate twice the number of leads than those using blast email software. 67% of B2B marketers have seen at least a 10% increase in sales opportunities through lead nurturing via Marketing Automation. Then consider that nearly 70% of businesses are using a Marketing Automation platform, or are currently implementing one (Aberdeen, 2014), and you should be thinking about Marketing Automation for your digital and inbound marketing efforts. 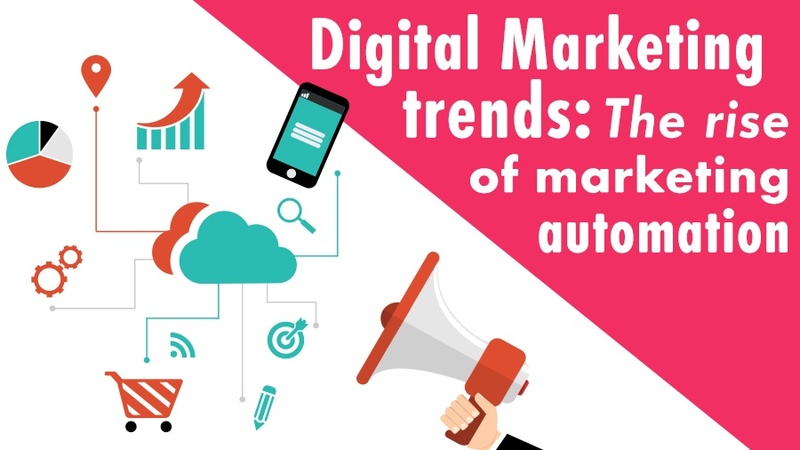 Marketing Automation is moving past just being a mere part of all the Digital Marketing trends out there. In an ideal world, Marketing Automation describes software and tactics which allow companies or businesses to nurture prospects via highly personalised, useful and relevant content. This content helps to convert prospects into customers and delight them so they become repeat customers. And much like its namesake, Marketing Automation takes all the guesswork out of the marketing process by using workflows to nurture prospects with delightful content typically delivered by triggered emails leading them down the sales funnel without overwhelming the prospect. This facet of Marketing Automation also applies to social media posts, database segmentation and lead scoring. With intelligent branching, within workflows, Marketing Automation takes into account how a prospect interacts with your communications and content and helps to further segment your contacts database effectively weeding out unqualified leads based upon your ideal customer personas. Where did Marketing Automation start? According to MarketingProfs, the rise of Marketing Automation began in 1992 with the first Marketing Automation tool called Unica. In the period of 2006 to 2008, with the increased adoption of high-speed internet, new vendors built cloud-based tools with emerging software which includes the likes of SalesFusion, SalesForce Pardot, Marketo, Loopfuse, HubSpot, OntraPort and much more. Following this, was the rise of social media. During this period, vendors evolved their Marketing Automation software evolved further. Now Marketing Automation platforms offer Email Marketing, Social Publishing and a wide variety of automated marketing tools. In 2015, per MarketingProfs infographic, 142,000+ businesses were using Marketing Automation Software. This number has now been on the rise in 2016 and 2017. Just take a look at some of the success stories that have happened with HubSpot. Today’s customers are present on multiple digital and social media platforms, and use these platforms to source information, products and services. As a result, marketers need to be targeting prospects and potential customers across many different digital channels to increase their rate of customer acquisition. Marketing Automation makes it really easy to engage customers across multiple channels. The lead nurturing process leverages personalised communication based on data you have collected about contacts in your contacts database. No potential customer wants to receive information from a company through emails that are irrelevant or not tailored to their specific needs and pain-points. Marketing Automation lets you segment your leads via lists, so you can target members of your audience in a more effective and personalised way. When leads feel like they are being communicated to more personally, they are more likely to convert into customers. One of the biggest benefits of Marketing Automation is that you are able to gain a better understanding of your leads. With features such as visitor tracking, you can track what web pages a lead has visited, what emails they are opening and engaging with, what links they have clicked on and which forms they have filled out. This allows you to segment your contacts database using all of this tracked data. Marketing Automation gives you greater insight into what your leads are looking at on your website. You can then use this collected data to improve your digital marketing campaigns and build much longer lasting relationships with customers and leads. With features like lead scoring within Marketing Automation platforms, marketers are able to concentrate their efforts on the most qualified leads. This score is based on a lead’s activity on your website and engagement with your communications. When a lead finally matures, reaching a certain value, a member of the marketing team can send a lead on to a sales representative so that the necessary action can be taken. With the alignment of both the sales and marketing teams, leads can be more easily moved through the whole marketing funnel through stronger coordination between marketers and salespeople. This can be enhanced by Marketing Automation. Marketing Automation platforms offer you in-depth analytics and reporting capabilities. You can effectively measure how successful your digital marketing campaigns have been and what kind of customers you have attracted in the process. With Marketing Automation solutions, you are provided with detailed graphs, statistics and other pertinent data that you can analyse and use in optimising future projects and campaigns. Future Marketing Automation platforms will be far more intelligent, lightweight and will plug in much smaller specialised applications. They will have access to a wealth of data and be able to deliver relevant recommendations to customers across various platforms and touchpoints. Predictive intelligence will be key to the development of Marketing Automation with platforms being able to adapt automatically as your business evolves and as your customers’ actions become more complex. Not only will platforms be far more intelligent but no longer will sales and marketing customer data be siloed in different systems. Marketing Automation platforms will bring all the functionality of separate systems together so that the gap between marketing and sales teams will be bridged more effectively. HubSpot is one of the few vendors taking steps forward in this regard. They are now offering free modules, such as their CRM, and lightweight plugins. All of these are hinting towards the Marketing Automation described above where software and tools will be more widely available and cost-effective. Marketing Automation is on the rise and will soon become commonplace in many digital marketing campaigns across a host of businesses. As a result, Marketing Automation is definitely here to stay. It eliminates the tediousness and excessive admin often associated with traditional digital marketing by automating everything. There is no stopping Marketing Automation in a business world dominated with the necessity for digital marketing. Do not think of Marketing Automation as just another one of those Digital Marketing Trends, but rather see it as worthwhile Digital Marketing investment.